While my sister and her boyfriend spent the day at Sawgrass Outlet Mall, Michael and I woke up at 6am to start our fishing day. Our first stop was the canal next to the Port Everglades Expressway. A friend of ours suggested this location to catch Spotted Tilapia, Mayan Cichlid and Yellow Belly Cichlid. 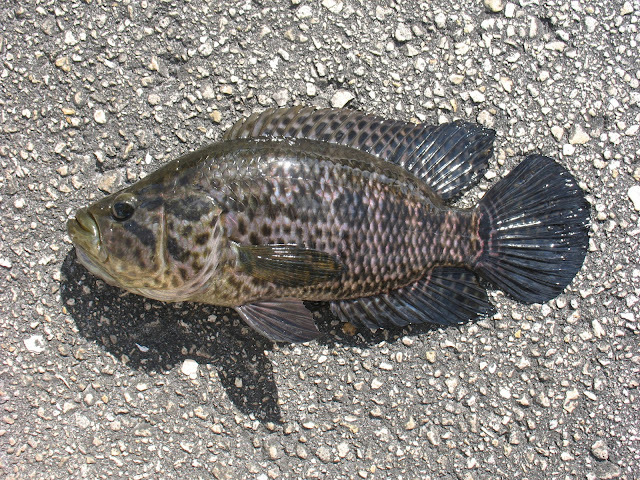 As soon as we started fishing, we found some Spotted Tilapia hiding under the dock. While I was catching more Spotted Tilapia to be used as bait, a Butterfly Peacock appeared out of nowhere to scattered the school. Unfortunately, the Butterfly Peacock, nor the Cobra Snakehead, came around to take our live bait. We were having trouble finding Yellow Belly Cichlid. I stepped back for a second to analyze the situation, then decided to search the rock crevices lining the shore. My worm was immediately grabbed by a Yellow Belly Cichlid! My thought was that with predators like Largemouth Bass, Peacock Bass and Cobra Snakehead swimming around, these small cichlids would not be caught hanging out in the open. It was great to figure out their hiding places and we caught many of them very quickly. Michael and I also caught some Mayan Cichlids, new to Michael, but I’ve caught them before. After checking off our target species at this spot, we headed to a set of urban ponds connected by canals. Our major target here was the Jaguar Guapote. On arrival, we caught a few small Yellow Belly Cichlid to use as bait. It wasn’t long when Michael saw a dark fish refused his live cichlid. I tried the spot again with another live cichlid. As the cichlid swam under a culvert out of sight, my line went tight and I set the hook on a decent size fish. There was a flash of violet and I knew it was the Jaguar Guapote! We were not sure why it had refused Michael’s cichlid but taken mine. I thought that perhaps the fish had seen Michael and refused the bait, while I freelined the cichlid so it would swim under the culvert so it would be out of sight. That was all the Jaguar Guapote we caught this day. Michael said he saw a couple more, and I might have seen another one, but the cold weather we experienced for the last couple of days must have turned these tropical exotic species into inactive mode. They simply didn’t want to play. We knew fishing was hard when Largemouth Bass were refusing to bite a lively cichlid! We had to constantly watch where we step since any shoreline grass could hide a Water Moccasin. We got a little scare when this snake crept up on us, but luckily it was just a non-poisonous Brown Water Snake. Aside from the cichlid and Largemouth Bass, there were a large number of Grass Carp in the ponds, as well as a small school of mullet plus a wayward Common Snook! It was quite the sight to see a 5-6lb snook swimming in this pond. There were a large number of plecos that ignored all our offerings, but we found a Brown Bullhead while deadsticking a worm. 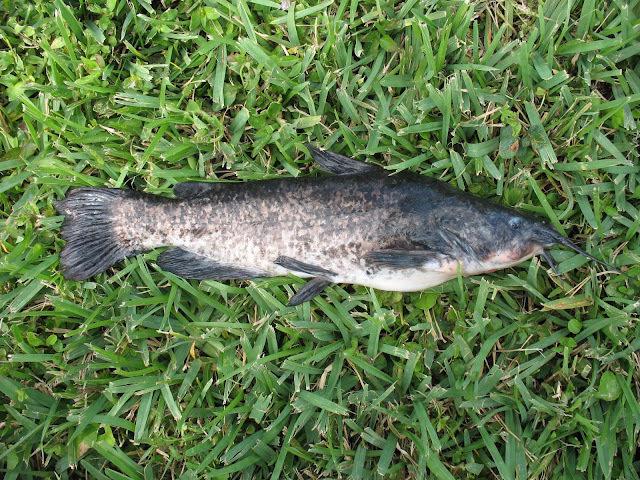 This southern population of the Brown Bullhead has very cool mottled marking that almost look like a camo pattern. After fishing at this location for another few hours, we decided to return to Coral Springs to try fishing the canals in the area for Cobra Snakehead. Since the water was cold, late afternoon gave us the best possible chance to find active fish. The water must have been too cold. We did not see any snakeheads nor received any hits. I had one hit that might just had been a Largemouth Bass. We were fishing soft plastic frogs trying for a topwater bite. After searching 2 canals for nada, we ran out of daylight. We had to return to my uncle’s house by 5pm anyways since we were meeting with my mom’s older sister for dinner that night. Here’s my family and my sister’s boyfriend. I spent the day with my sister and her boyfriend at Kennedy Space Center. We had a great time and it was a non-fishing day for me. It was a little cold and wet but we still had a good time. We dropped Michael off at Port Canaveral and he caught a couple of Bluefish, a Spot Croaker and a Gaffsailtop Catfish. At the end of the day, we drove to Coral Springs to spend the next few days at my uncle’s house. We woke up early only to find a very cold and rainy morning. Behind the winter storm that delayed our trip, a cold front followed and the temperature plummeted to about 5C in Orlando that evening. My sister had planned to visit Universal Studio and Michael and I had planned to fish in Tampa again, however, the rain didn’t let up until 10am. While my sister and her boyfriend got ready, Michael and I checked out a little pond behind my cousin’s neighbourhood. We found a number of sailfin catfish that were unwilling to bite worms. After I dropped my sister and her boyfriend at the theme park, it was a little too late to fish Tampa. I joined Michael at the pond trying to find a way to catch the sailfin catfish. We did catch a few small Bluegill Sunfish and Michael caught his first Golden Shiner. After lunch at my cousin’s house, my cousin suggested that we should try the lake close to their house. Among the common freshwater species was the potential of finding Florida Gar, a species new to both Michael and I. My cousin and his daughter Ava came to fish with us. Ava was the superstar that day when she found a 13” Black Crappie. These crappies were schooled under the dock and we caught 3 more between 12-14” that day! 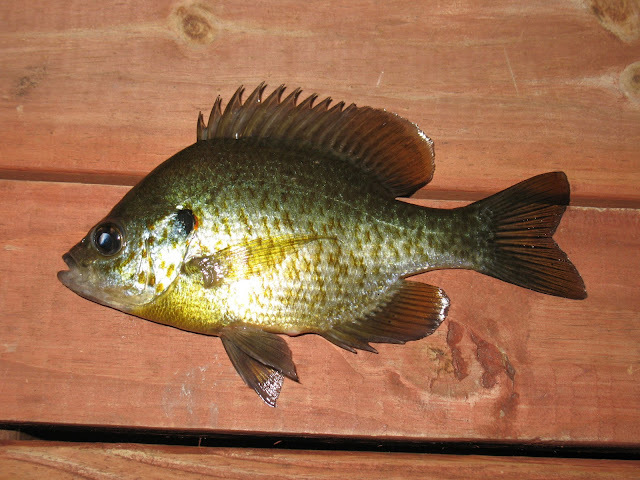 There were also some very massive (by Ontario standard) Bluegill Sunfish. Michael cut up a small sunfish to use as gar bait to be fished on bottom and got a fish to take the bait. However, the hook didn’t set and left us wondering if it was a gar. While we didn’t find any gar that day, I caught a pair of Redear Sunfish. I caught a suspected juvenile Redear Sunfish in Virginia but didn’t count it since the identity could not be 100% verified. The Redear Sunfish was one of my top target to catch so it was nice to check it off so early. Later, I caught a 6” Golden Shiner and suggested to Michael to use as live bait. A while later, the Golden Shiner got picked up and it was a Largemouth Bass. Michael said it was at least 3.5lbs…but I said it was between 2.5-3lbs. That was it for the day of fishing. 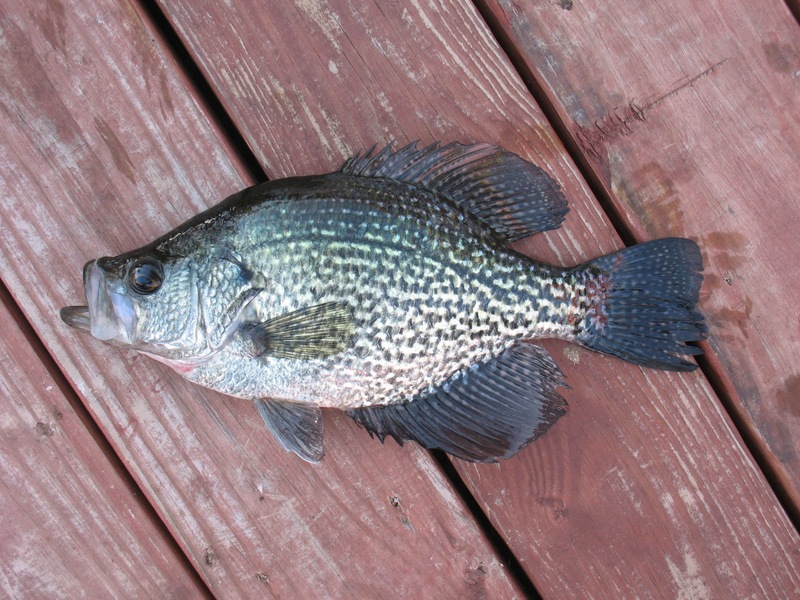 We took the 4 crappies and one big bluegill back to my cousin’s house and had a Florida shore lunch…it was so good!! !